P5	P7	P8 What are Natural Resource Charter precepts? The central government should link revenue distribution to the expenditure responsibilities of local governments, and be proactive in building the capacity of local governments to manage these responsibilities. National governments often share the responsibilities of governing with local governments through a process of decentralization, including on natural resource governance. 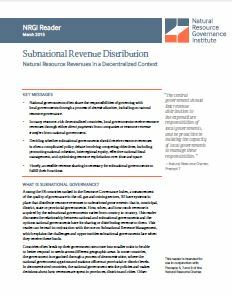 In many resource-rich decentralized countries, local governments receive resource revenues through either direct payments from companies or resource revenue transfers from national government. Deciding whether subnational governments should receive resource revenues is often a complicated policy debate involving competing objectives, including promoting national cohesion, interregional equity, effective national fiscal management, and optimizing resource exploitation over time and space. Timely, accessible revenue sharing is necessary for subnational governments to fulfill their functions.